Please select a Wheel Location & Tire Size to view availability. 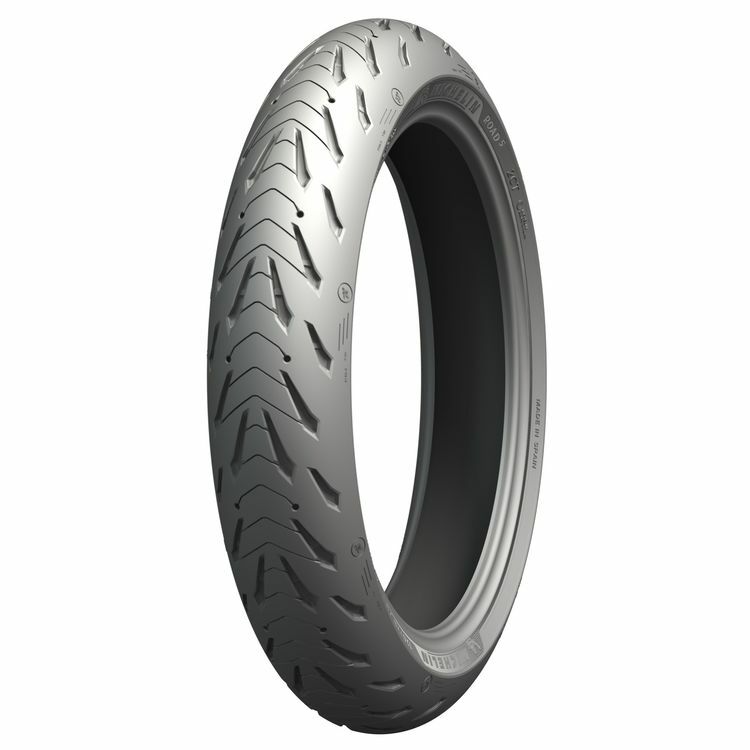 Specifically designed for larger adventure bikes and building upon the success of the Pilot Road 4, the 5th generation of the popular Road series drops the "Pilot" prefix and takes on more of an all-purpose approach to an all weather sport and sport touring tire. In wet conditions, we change the way we ride. Wisdom dictates less aggressive lean angles when traction is questionable due to slick roads. In dry conditions, well, we're out having fun. The design of the Michelin Road 5 Tires takes these complimentary riding styles into account. The section of the tire that sees the most use during day in, day out, even spirited riding is outfitted with deep, water-evacuating sipes. The edges of the tire, those that are only called into action during aggressive riding on dry pavement, are uninterrupted expanses of a softer tread compound. The biggest selling point of the Road 5 is wet-weather longevity. Michelin essentially reinvented the wheel when they engineered the water evacuation siping of the Road 5 tires. These channels actually flare outward towards the center of the tire as opposed to grooves getting narrower as they get deeper. Water needs to be displaced as a tire rolls over it. As a typical tire wears, the negative space between the tread gets progressively smaller and smaller. When the P5 wears, it maintains a more consistent volume of negative space where water can disperse. This translates into more confident wet-weather cornering and emergency braking throughout the life of the tire. I have been running PR4's for the past few years, and very satisfied with them. I currently have the PR5 rear and the PR5 Trail front ( because of size availability - Triumph Tiger ) and so far, so good.I have several thousand on the rear and yes, it is starting to square up a bit, nothing too objectionable and certainly not unexpected. The front is basically new and again, so far, so good. Temperatures are in the 20's and 30's so it will be awhile before I am able to lean into corners very much. My biggest challenge was looking at the orientation of the grooves in the tire. The front appears to be reversed but it is not - as the directional arrow confirms. Dealer had installed the PR4 backwards... still got 8,000 plus out of it. I installed this one and it rides great so far. Highly recommend these tires. I have a 2013 GS 1200. It takes 120 70 R 19 on the front and 170 60 R 17 on the rear. Any idea when you will be getting these sizes in for the Michelin Road 5 Trail?